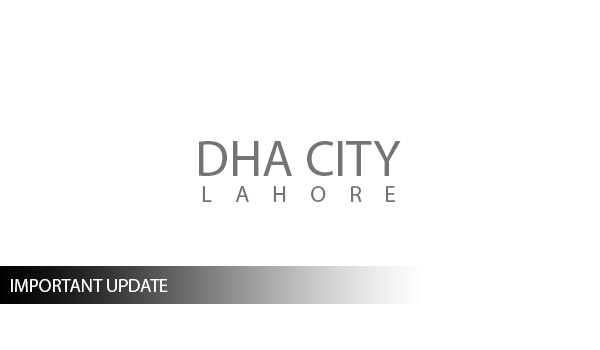 What’s the latest on DHA City Lahore? DHA City Lahore is one of the few Defence Housing Authority (DHA) projects that has faced controversies as grave as fraud amounting to billions of rupees. For years, there was silence over what was actually happening with the project and why the developer was not moving forward with development plans. It was later revealed that the Globaco (Pvt) Ltd., the company assigned to acquire land for this project, did little in this regard and moved funds to its own account for personal interests. Just when the file owner couldn’t bear this silence any more, there came a public announcement by the DHA that it has contacted a relevant body to investigate Globaco (Pvt) Ltd. This news spread like wildfire and, interestingly, the market rate of these files went up. Rarely have I seen bad news pushing property rates upwards! Needless to say, this news was rather good for file owners as they firmly believe that their DHA investments will remain safe. This public notice was an indication that the matters delaying the development of DHA City would now be duly addressed. I recommend you also look at the latest listing of plot files for sale in DHA City Lahore. I have lately observed that whenever there is news about this project, investors are suddenly more interested in these files. Over the last couple of weeks, there hasn’t been any news – well, at least nothing mentioning DHA City in particular – but the across-the-board accountability reforms currently sweeping over the country say it all. 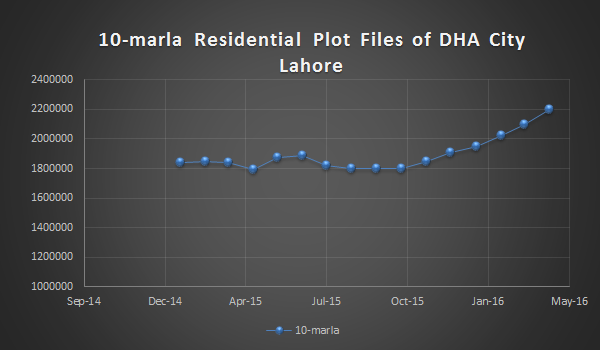 Right now, the rates of DHA City plots files are stagnant at PKR 1,350,000 for 5 marla and PKR 2,200,000 for 10 marla. The fact that these files have stood their ground suggests that rates are preparing to climb upwards. Moreover, I am positive that the DHA won’t ever abandon DHA City file owners. When push comes to shove, it will offer alternate files to the owners. For relocation, a couple of projects are deemed appropriate, including DHA Prism 9 Extension, DHA Rabhbar Phase II Extension and EME Society. In this regard, balloting is expected to take place soon. According to a source who requested anonymity, balloting might take place within a month. As a lot of DHA City files were sold, which itself was a part of the scam, chances are that DHA might have to settle some in the originally planned area of the project. For this, DHA needs finances to purchase the land itself to develop. And here’s another update: DHA has recently retrieved some funds, so that time might be close. I think the DHA City matter will be fixed in about a year or so. At the very least, we will be able to see what direction it’s headed in. The balloting of DHA City files that are to be relocated is also deemed close as DHA hasn’t yet released the Prism 9 Extension files in the market yet. We know that Phase IX Extension files will be balloted soon after they are released and DHA City file owners will also be included in this ballot. The way I see it, the DHA city file rate will go up soon, entirely because investors have complete trust in DHA, and rightly so as the recent turn of affairs suggests that we will soon hear good news about this project. To satisfy your thirst for complete knowledge about the price trends of these files since January 2016, I have prepared the following graphs. 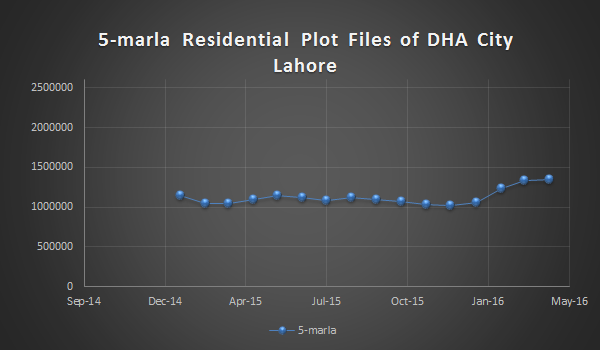 Please note that 1-kanal residential and commercial plot files of DHA City aren’t being traded in the market so I can’t quote their average market rate.